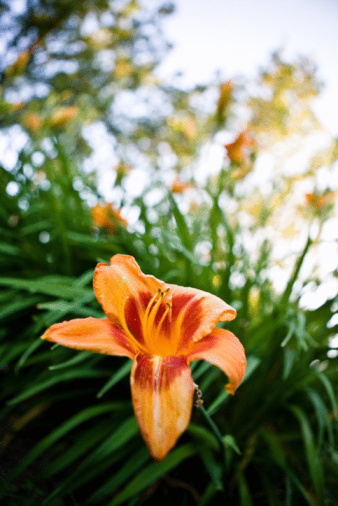 Asiatic and Oriental lilies are true lilies, and grow long, strap-like leaves and wide blooms. These plants do best with spring planting, quick-draining soil and full sun, and live for many years with the same bulbs. It's a good idea to prune and deadhead Asiatic lilies during the growing season, to keep them blooming, and then cut them back in fall for their winter dormancy. 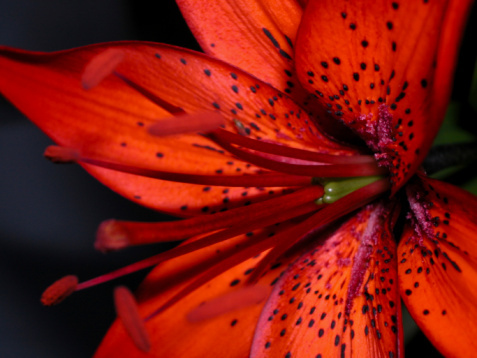 Lilies grow in a wide range of colors and patterns. Deadhead your lily when the plant is in bloom. Cut the flowers when they open and take them indoors to a vase, or maintain them on the plant and cut them when they fade. Make the cuts at the base of the flower stem, where they join the plant. Cutting the flowers before they go to seed allows the plant to put energy into new blooming and more flowers. Prune the foliage of the plant during the growing season as well. Cut off brown or yellow foliage at its base to help the plant conserve energy. Plants that receive frequent pruning are healthier and feature more new growth. Cut the lilies back in fall, after the first frost of the year, when the foliage is dead and comes off easily with pulling. If it doesn't, cut it to 1 to 2 inches long. In warmer areas like United States Department of Agriculture Plant Hardiness Zones 10 and 11, where frost falls late in the year, force the lilies into their dormancy by cutting foliage down to 1 to 2 inches in October or November. The lilies require this resting period for the next year's bloom.